DK Sushi, to open in Penn Food Hall, is a spin-off of Double Knot. Two high-profile restaurant operators will open spin-offs as they join the lineup at Franklin's Table Food Hall, due to open in mid-March at 34th and Walnut Streets at the University of Pennsylvania. 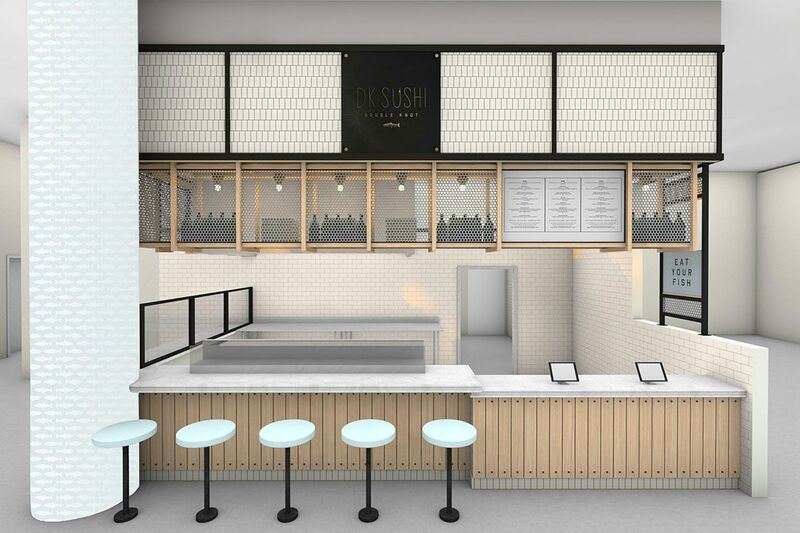 Michael and Nina Schulson's Schulson Collective will open DK Sushi, a scaled-down version of Double Knot's red-hot sushi bar on 13th Street in Washington Square West, overseen by chef Kevin Yanaga. Ellen Yin, Eli Kulp, and Roberto Sella of High Street Hospitality Group will open High Street Provisions, a version of the dayside cafe at High Street on Market, their restaurant in Old City next to the landmark Fork. Already announced are the remaining stalls, from Goldie (falafel, tehina shakes), Kensington Quarters (burgers), Pitruco Pizza, Little Baby's Ice Cream, and The Juice Merchant. The hall — leased by Jacob Cooper and Matt Stein of MSC Retail — will have 174 seats and be open for breakfast, lunch and dinner, seven days a week. Yin said High Street Provisions' menu would include baked goods, breakfast sandwiches and other sandwiches, salads, and Rival Brothers coffee. Yin, a Penn alum, said she considered the location, formerly Moravian Food Court, to be the "entrance to Penn" and said she was "excited to be in the mix with these other high-quality operators." She said the that part of the Penn campus needs "fast, high-quality food," given the sit-down restaurants on the 3400 block of Sansom Street. At DK Sushi — a brand that the Schulsons want to build on — Yanaga will create a menu of a la carte items and sushi boxes that will be made to order as patrons order on touch-screen kiosks. Delivery will be available. There also will be an eight-seat chef's counter for Yanaga's multicourse omakase, which will include 12 to 14 dishes for $40 to $50 — offered for dine-in only. Boxwood Architects is doing a clean design using materials such as oak, hot rolled steel, brass, and white tiling and marble. A wall is made of Bianco Carrara marble is edged with a decorative crackle tile in an abstract fish scale pattern. Other merchants are due to open for breakfast, though DK Sushi's hours will be 11 a.m. to 8 p.m. Monday through Friday, till 7 p.m. Saturday, and till 5 p.m. Sunday. Michael Schulson has been on a hot streak of late, building on Sampan (and its Graffiti Bar), Independence Beer Garden, and Izakaya with such newcomers as Harp & Crown, Monkitail in Florida, and catering division. He also is developing Giuseppe & Sons, an Italian restaurant next to Harp & Crown, and this week took over Osteria in Spring Garden. Rendering of Penn Food Hall.